The front door the first chance you have to make a great impression on your guests when they arrive. You want to greet company in a way that is inviting and also eye-appealing. If your front door is less than exciting, there are several things that you can do. These slight improvements can be done quickly and they are affordable. The best part is, they are going to make a big difference in the overall appearance of your home. There are plenty of options available to enhance your front door. A small change can give your home the fresh, updated look you want. From switching out the mat, to changing up the mailbox, there are many tips and tricks available for giving your front entryway a stunning new appearance. Your door mat sees a lot of action. Even though it is on the ground, everyone is going to look at it. Make a difference by swapping out an old, dirty, worn out mat with one that is bright and new. Over time, your mailbox is going to get weathered and worn down. By switching it with a newer, shinier version, your home is going to really sparkle. There are countless options available when it comes to mailboxes, so choose one that suits your personality and coordinates with the rest of your front entryway. Your house number is usually displayed on the front of your home. There are many ways to switch up the way you showcase your street number. You can purchase new numbers from a local home improvement store to replace your outdated ones. You can also use a vinyl adhesive to display the numbers right on your front door. We sell decorative address plaques from Whitehall in many shapes and sizes. These plaques are made to order with many colors to choose from. Lighting is a big part of any home’s exterior. A quick and easy change can be done by replacing old light covers. These are both affordable and attractive, adding the level of curb appeal that you are striving for. Although hardware like your door knocker may seem insignificant, by exchanging it with a new design, you can alter the entire look of your front door. Try out different models to see what you like the best. You can also coordinate the handles, mailboxes, and other pieces to match. Breathe life into your entryway by adding life. You can quickly spruce up your front door area by adding in some potted plants. Choose plants that are easy to care for and fit the sun lighting requirements that are achievable in the designated area. The limits you have on the pots you plant in are never-ending and easily coordinated to your home’s exterior. The front door is the main focal point of the entry way. One thing you can do to the door to really make it pop is paint it in a bright color. This will make a statement and it’s quick and easy to do. You can also swap out your glass insert to give the old door a brand new look. You can make your home unique by adding your own personal greeting to the front door. With vinyl lettering you can create a message as simple as “Hello” to display for guests to see. Other common displays with this type of lettering include your name and street numbers. The door has been repainted in a bright bold color and you have added some potted plants to liven up the area. You can really make a pop by color blocking the plant pots to match the door. The colors create a unity that is appealing to the eye. 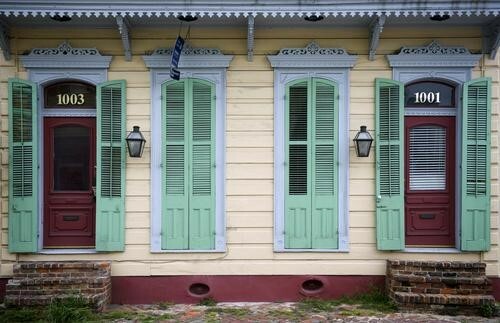 Install a pair of operable shutters on the front door to capture a New Orleans feel. Your front door and its shutters should not match. If you have window shutters, finish the door shutters to match. If your door is stained and varnished, choose a neutral color of paint for the shutters of your own unique style. Before you break the bank doing a remodel on the front of your home, consider what can be done to change up the look with more affordable solutions. With a simple coat of paint, addition of a plant, or a changeup of the mat, you can give your front door a makeover in under minutes. Contact us today if you need help on your front door makeover!